A couple of days late but I’m on vacation so that’s okay. 127 miles this month. A pretty light month in terms of activities. 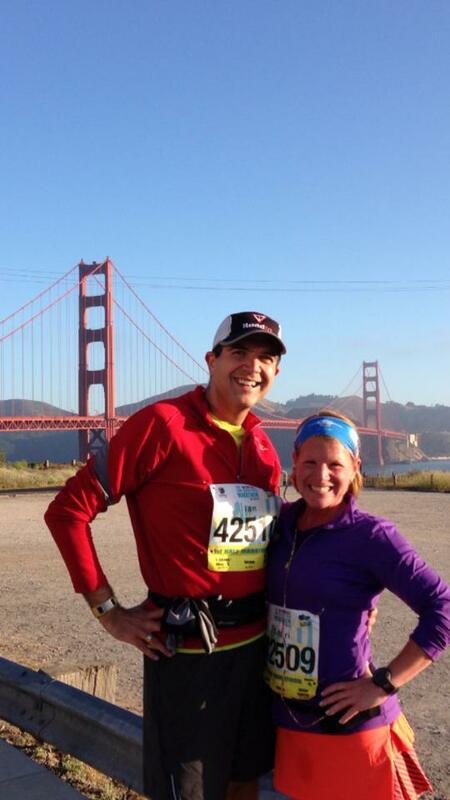 Just one race, the San Francisco Half Marathon, which my wife and I ran as part of our 10th anniversary trip. That was a great race. You can read my recap here. 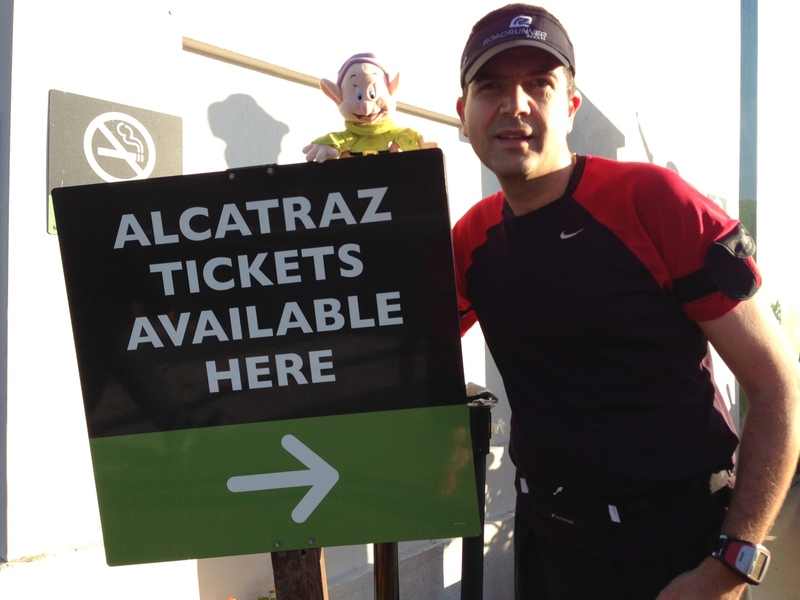 Whilst on the trip to San Francisco I did my Dopey run. There is still chance to sign up for the race as it is open through July 31st or until all the spots have been filed. Head over to the event page or my Facebook page to see some of the great photos that participants have been submitted. I’m on vacation this week and so I’m taking advantage of the time to run with my wife and my boys. The weather is cooler than last year (i.e. not great) but it’s perfect for running and biking. 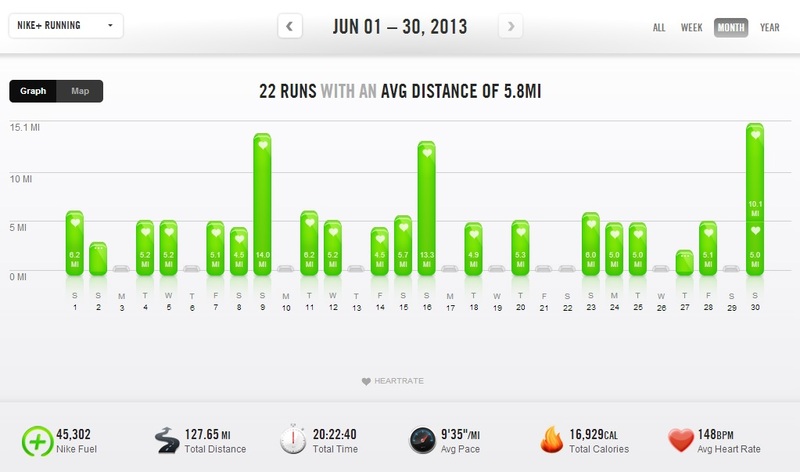 I’ll take a little rest after vacation as my training for the Philadelphia Marathon starts in mid-July. Once that starts it is all go all the way to the finish line of the Dopey Challenge next January. I did sign up for a couple of races which will be new ones for me this fall. The Cooper Norcross Benjamin Franklin Bridge Run (a 10K crossing the Delaware River between Camden, NJ and Philadelphia, PA) and the Trenton Half Marathon (crossing the Delaware River between Trenton, NJ and Morrisville, PA). 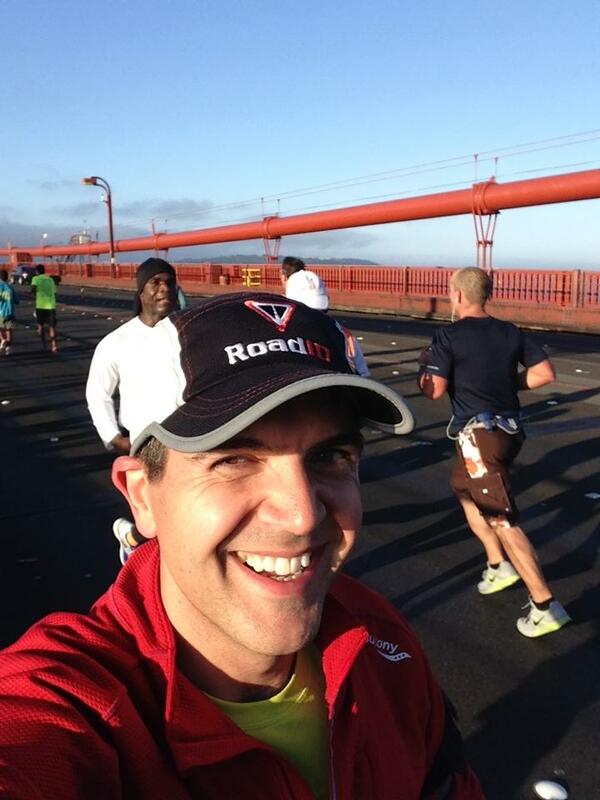 It sounds like I like to run bridges, but after running the Golden Gate Bridge who can blame me? It’s been quite a fun couple of weeks. I got back from our anniversary trip to San Francisco on Tuesday and I had a few days at work before I had to head off for a short business trip to St Petersburg, Florida. Sure enough we didn’t waste a minute over the weekend as we tried to squeeze in as much as we could into the time we had available. 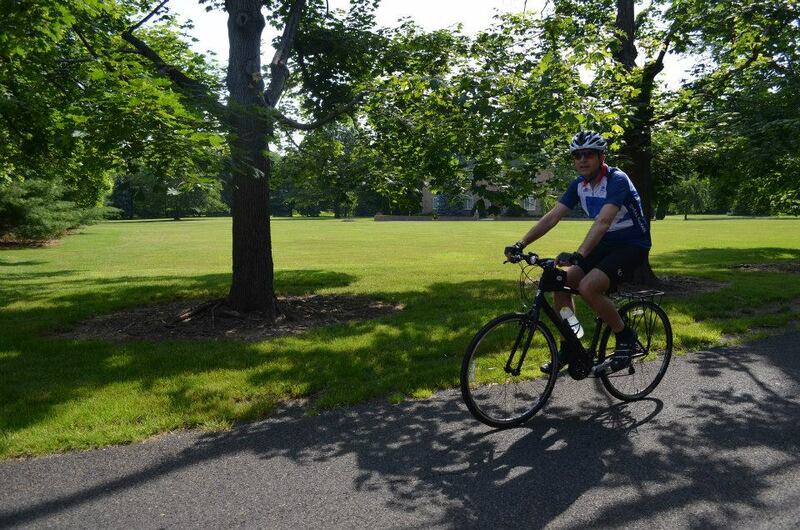 On Saturday I took part in the ‘Cycle Bucks County’ event for the second year. I had bought my bike (a Trek FX 7.2 hybrid) back in February 2012 and had riden it a few times on relatively flat terrain. 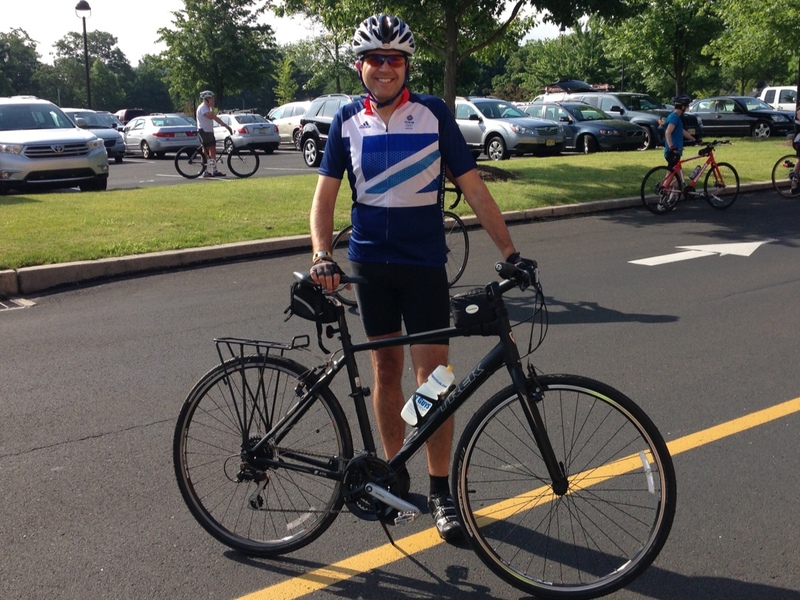 What I didn’t expect when I turned up for the 25 mile ride (which at the time was the furthest I had actually riden) was how hilly Bucks County actually was. The ride had a net elevation of about 1,600 feet. I’d only ridden on the flat as I mentioned earlier. At one point in the ride last year as I struggled to get up a really steep climb (Wismer Way) I looked around to see people actually walking their bikes up the hill. I didn’t know that you could do that and I was killing myself trying to pedal up. Needless to say I joined the crowd and hopped off my bike to walk uphill (probably faster than I was actually cycling). 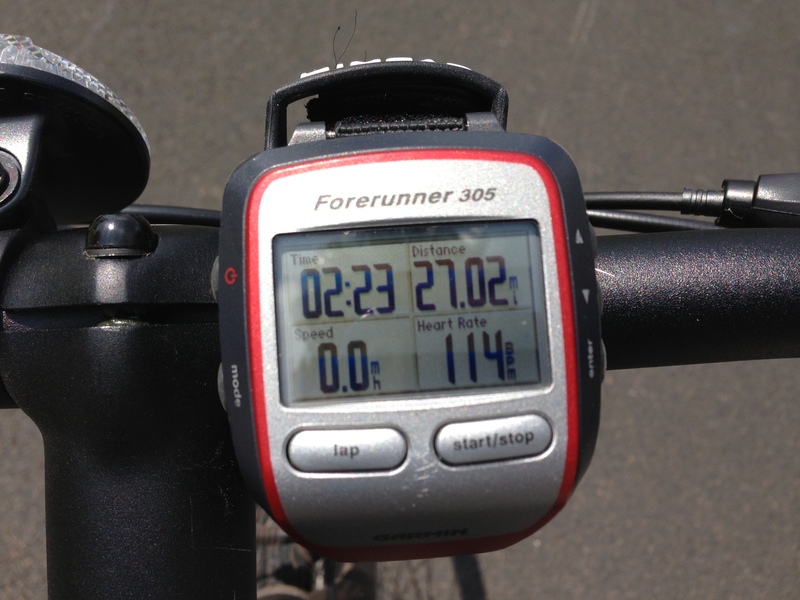 This year gave me a chance to revisit the ride and test my fitness against last year. I again had signed up for the 25 mile route (there was also a 50 mile, 60 mile and 10 mile family ride) and proudly wearing my Team GB cycling jersey (you have to look the part) I took to the start line. 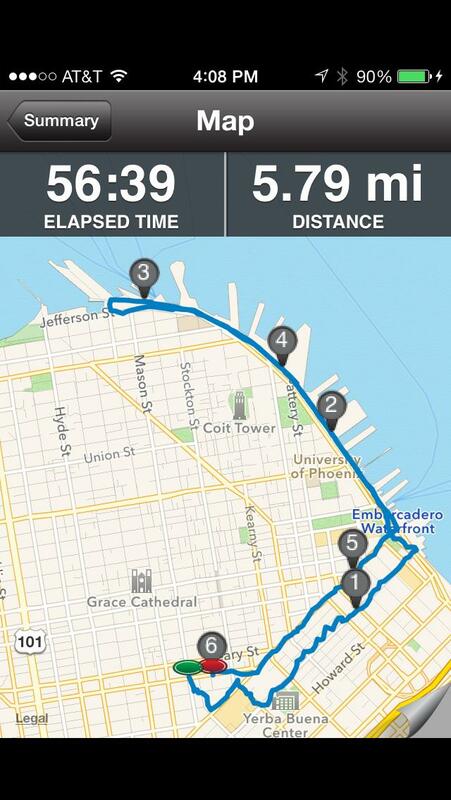 I couldn’t remember where the big hill was or what it was called and to be honest where I was going (I have to thank the kind guy in the minivan who told me where all the cyclist went as I was mid pack but had no visual to the riders ahead) and figured I had just run in San Francisco I must be able to do those hills. Well…I found the hill and it again beat me but I think I got further up than last year and I was more than happy to jump off and walk up. No point in getting hurt for a fun ride. as I mentioned before there was almost 1,600 feet in elevation and this was pretty much an out and back course so as they say “what goes up must come down”. I’m not a big fan of roller coasters. I pretty much like to be in control of my speed and direction but let’s just say there were a couple of frightening moments as I plummeted down some of the hills at (according to my Garmin) over 31 miles per hour….WITH THE BRAKES ON!!! Either I missed the rest stop at half way or there wasn’t one (there was confusion amongst the riders) so I decided to power on home back to the start/finish at New Hope-Solebury High School and enjoy the beautiful scenery of Bucks County (when I wasn’t holding on for dear life trying to slow down). Around mile 23 when I was close to home I had a feeling that I wasn’t going back the way I came been though I and a couple of other riders were following the temporary road markings. 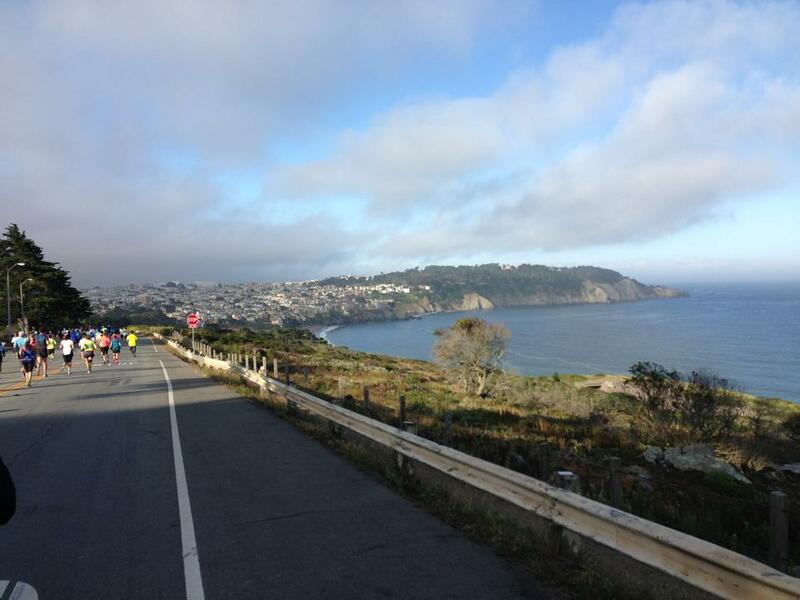 At mile 25 with no finish line in sight I began to worry I had caught up and followed the 50 mile riders. 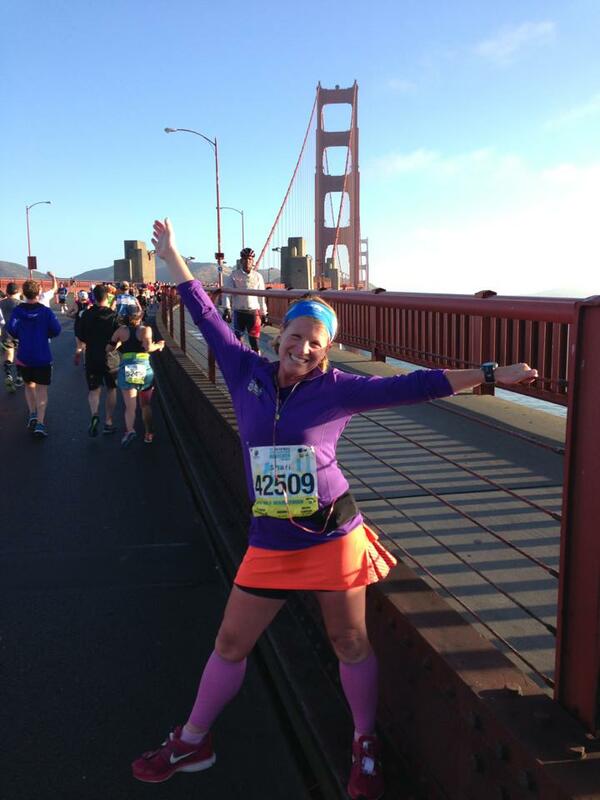 I think I had maxed out my comfort in the saddle around mile 22!!! Luckily I was wrong to be anxious and we turned into the school entrance from the opposite side to last year. The route was actually 27 miles this year. Either that or I had got lost somewhere and didn’t know it. Anyway, mission accomplished and I gratefully sat on the grass and enjoyed myself with some of the post race treats on offer. Yes, I’ll probably be signing up for it again (unless I can convince my wife to let me do the Philly Tri next year). 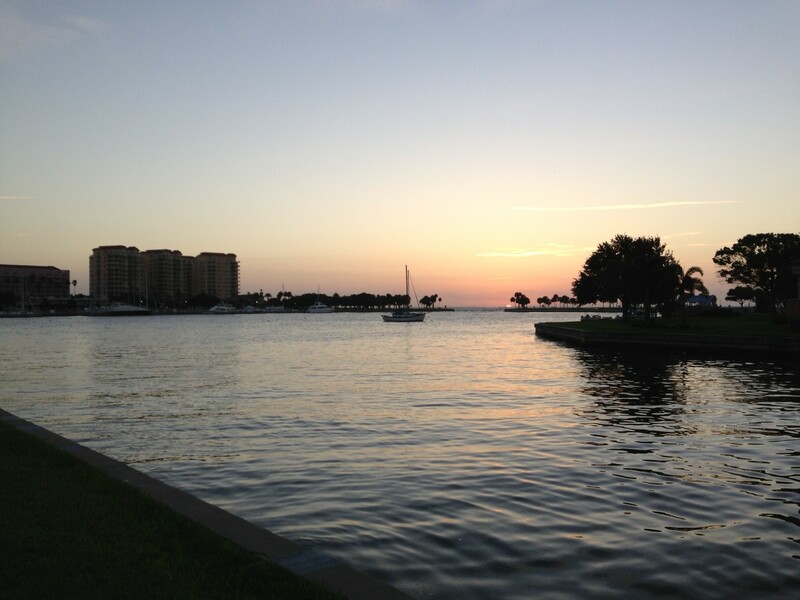 On Sunday I had to take an evening flight for a business trip to St Petersburg, Florida. My wife and I both wanted to get a run in and have time to see the new Pixar movie ‘Monsters University’ with the boys so our solution was to run on the canal with the boys in the double stroller. We got up early to keep to a schedule and left the house pretty much around the same time we leave on a school day with the boys. We arrived at Cramer’s Bakery (our usual start and finish point) and got ready to set off. We hadn’t yet given the boys breakfast before we left although we had packed lunch for later in the day so as I set up the double stroller my wife ran into the bakery and grabbed some treats for the boys. Wow, all I can say is that if you feed a kid a muffin you hear nothing out of them for at least the first 2 miles into a run. The trade-off I guess is that you cannot do that on every run or the stroller will get too heavy to push LOL but it worked for when we needed it. 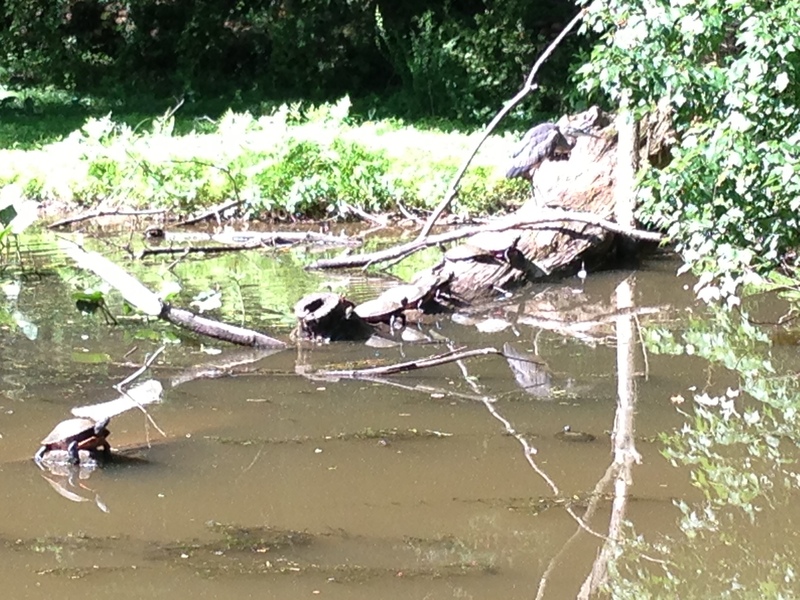 It was a fabulous if a little warm day to be running on the canal and it turned into somewhat of a nature walk as we spotted (as my eldest son correctly pointed out) herons and dragonflies, families of ducks and geese and at one point 6 turtles resting on a log. Nice. Nature. Turtles on a log. Keeping our eye on the clock we quickly finished our run and loaded up the car to head to an 11am showing of ‘Monsters University’. What a great movie for parents and kids alike. I remember seeing the original movie with my wife in the days before the kids but I really had fun watching it with the boys. In fact we were cheering and laughing together. It was great. After the movie my wife and the boys headed off to the community swimming pool and I showered and headed off to the airport. 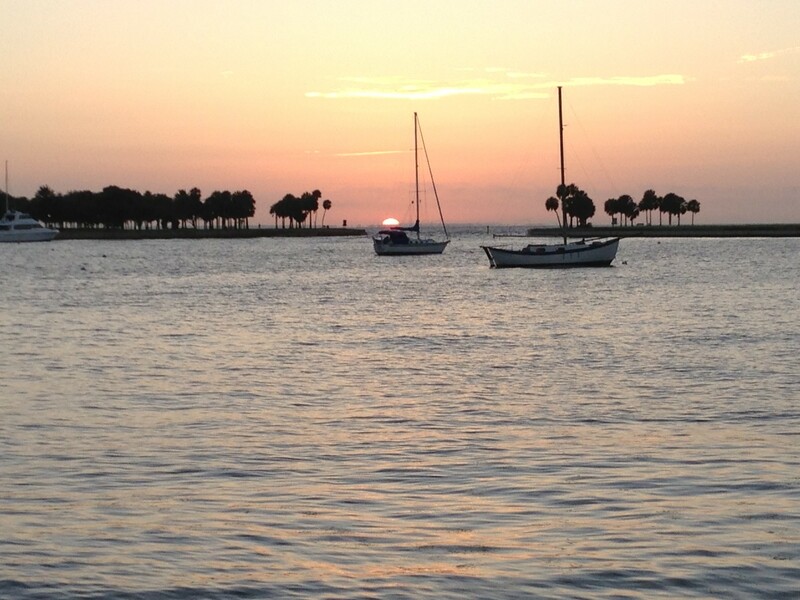 I arrived in St Petersburg late on Sunday night and planned to run and explore early the next morning. Two things were immediately apparent on Monday morning. First, the sunrise was almost an hour later than at home and secondly it was way hot and humid. 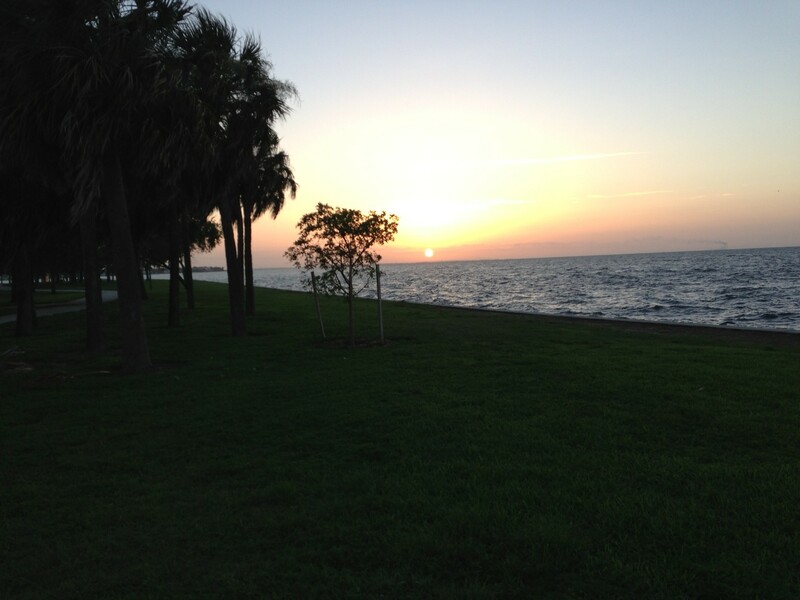 I got to see a beautiful sunrise as I ran along the bay, taking in the pier along the way. It’s was fantastic to see all the wildlife and the activity by the water. It was hot and I very much appreciated the view but it looked better inside with air conditioning. 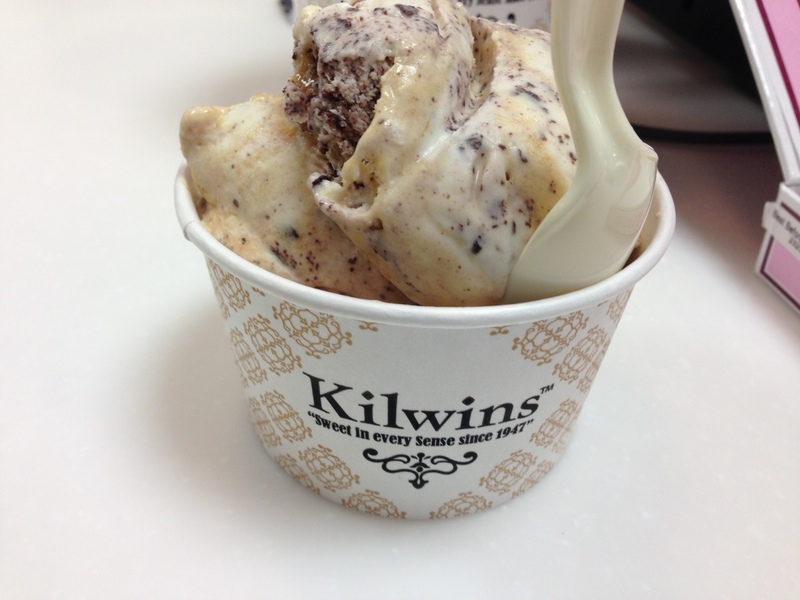 That night as I was walking to the restaurant I had chosen for dinner I passed by a Kilwins’. This is a chocolatier and ice cream parlor chain that my family and I visit when we are in Sarasota, Florida. Well, I had to take it for the team. There was no one else around to help so I had a nice portion of St Peter’s Mud for everyone who couldn’t be with me (chocolate pieces in caramel)….yum! So…this meant I had to run to earn my calories back for the next day. On Tuesday I had arranged an 8am meeting so I had to get up earlier than the day before. This actually gave me an opportunity to try to beat the heat. Although the bayfront trail was lit I still put on my headlamp for the unlit areas I was running and headed out for another run. Even without the sun it was still really hot and humid. I ran a nice relaxed 5 miles like I had the day before except this time I ran past the pier and headed out further amongst the houses along the bay. Very pretty. I made it back just before sunrise and had breakfast, showered and packed my suitcase in time for my 8am meeting. I plan on taking a couple of days off when I get home as we will be down at the Jersey Shore all next week for The July 4th holiday and I want to be rested well so I can enjoy some long runs early in the morning and with my wife and boys as well as some bike rides. I’ll earn my calories for all those boardwalk treats next week. Something I’m very much looking forward to. 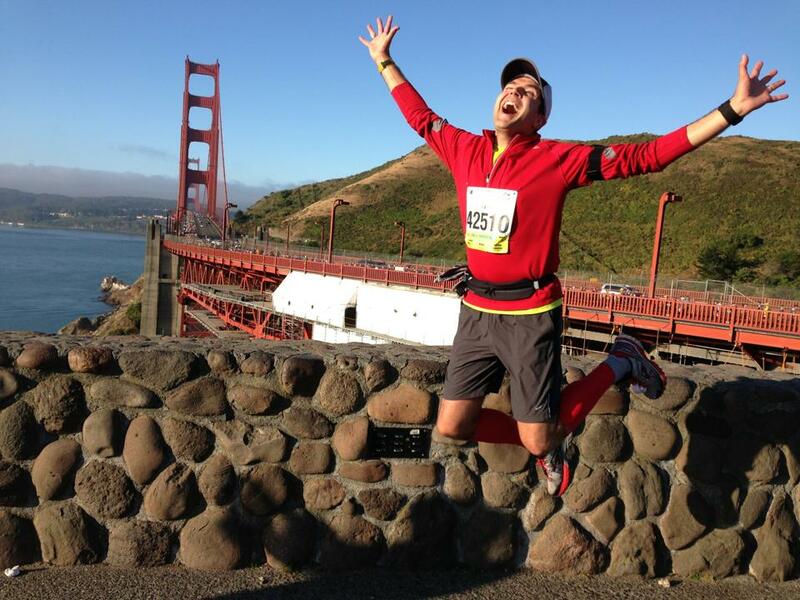 I run for health, fun and to be able to have the energy to spend a week with my two wonderful boys. Happy first day of summer to you all. 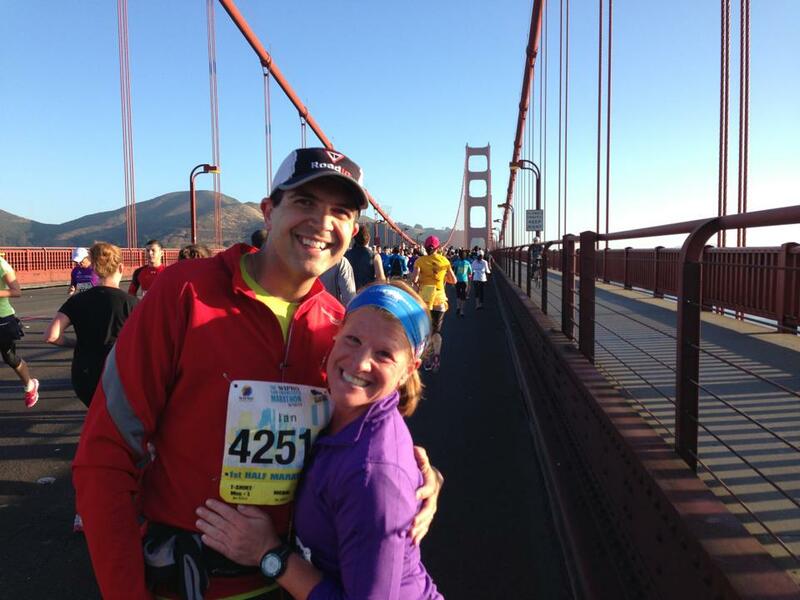 As I had previously mentioned in an earlier post my wife and I signed up for the San Francisco Half Marathon as part of our 10 year wedding anniversary getaway. 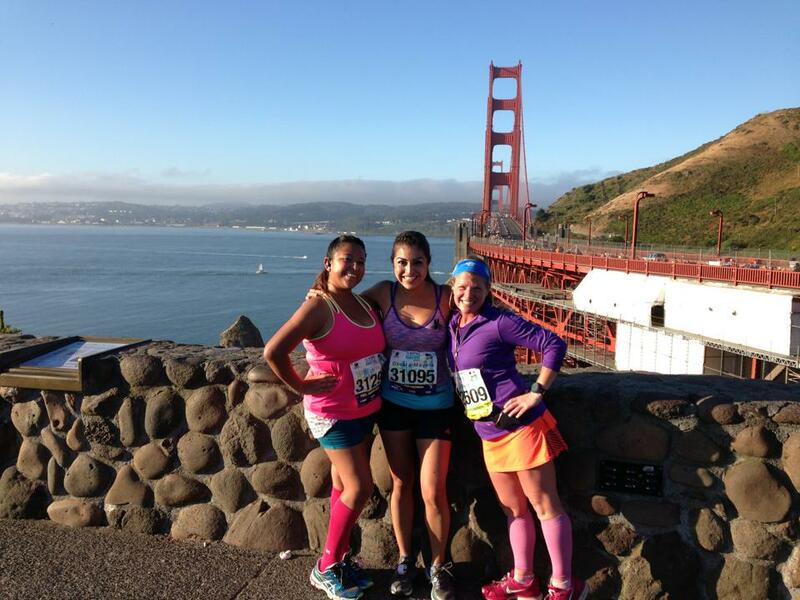 Nothing says love more than 13.1 miles together starting at 5.30am. 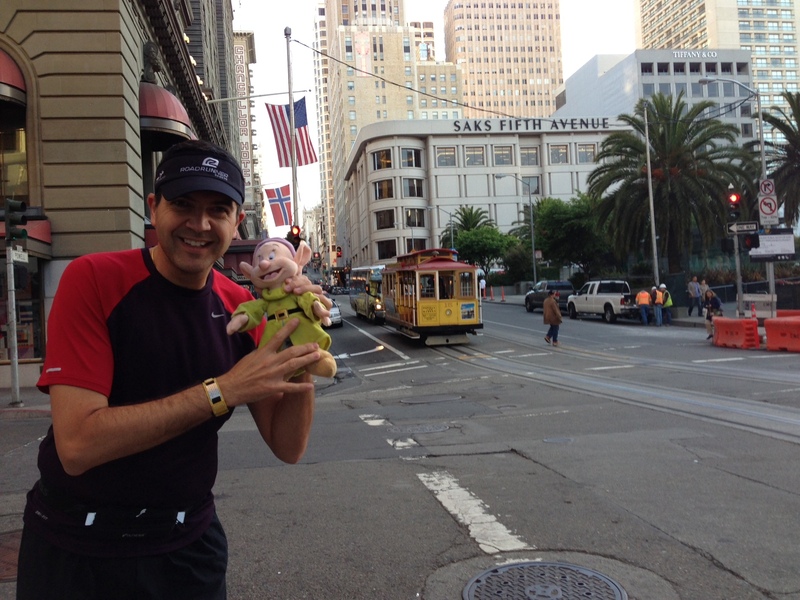 We arrived in San Francisco early afternoon on Thursday (thank you US Airways and Mother Nature for our 3 hour delay) and once we were done checking into the hotel set out to explore the city. 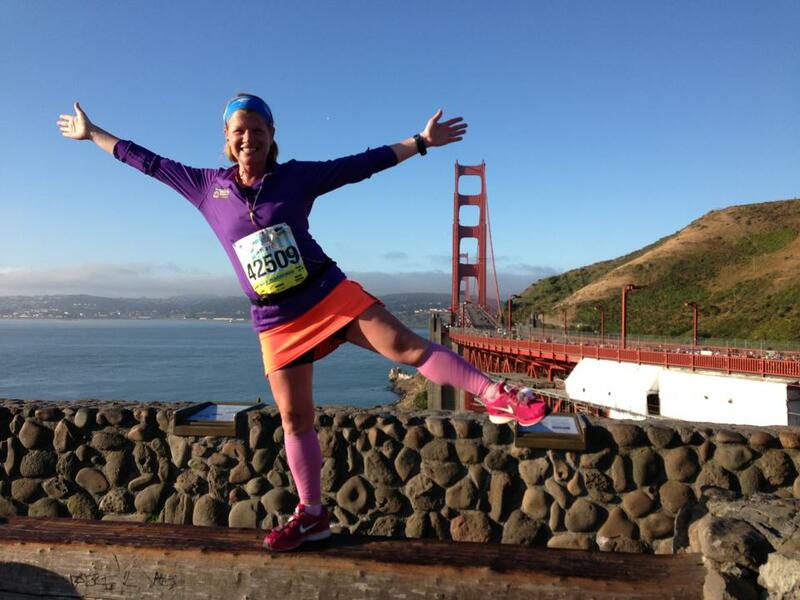 Now, when getting ready for a race the best thing is to get acclimatized (adjust to any differences in weather and time zones) and pretty much take it easy and stay off your feet before the race. Well, you don’t know our family. We don’t miss a beat. Always on the go and this was no exception. We tried to start our trip off like typical tourists and explored the city. 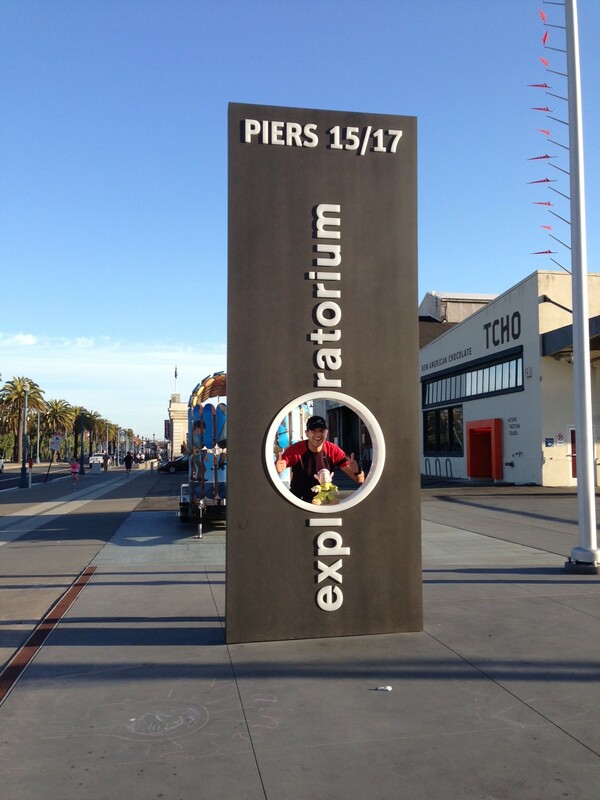 We jumped on a cable car which would take us up the streets and end at Fisherman’s Wharf. FAIL…the cable car broke down (lost hold of the cable) about 2 blocks after we started. They have a no refund policy and rather than wait to start all over again on another trolley we started what would be a pattern for us for the whole visit. We walked. 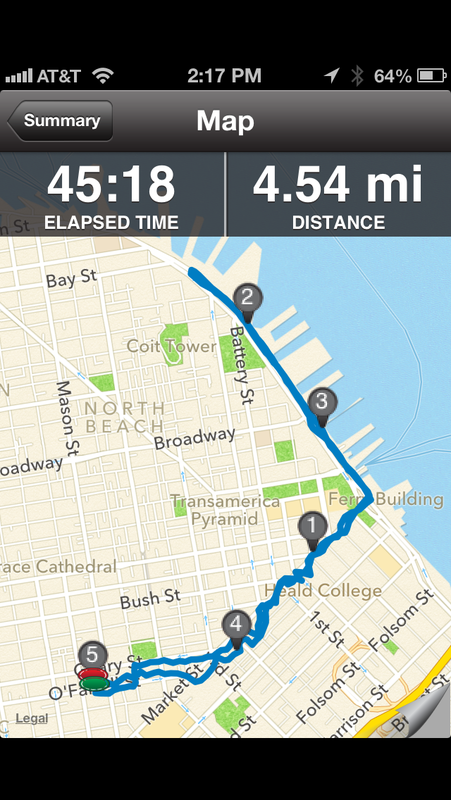 Did I mention that San Francisco is quite hilly? Really? I hadn’t mentioned it yet? We very quickly discovered why people take trolleys…the hills are kind of steep. Not to be too disheartened we joked that thank goodness we run marathons or we wouldn’t have been fit enough to make it to the top of the streets. We continued much in this vain throughout the weekend. Walking up and down hills including the climb up to Coit Tower. Quite a few steps in addition to the hills. By Saturday lunchtime we had to find a place to sit down for a break as walking down the hills had left our legs a little shaky…and we had a half marathon in just over 12 hours. As I mentioned in my previous post we ran every day where were there too. What a great way to get out and explore a city. So yup, we were being really sensible just before running a half marathon. We had run the 2 days prior to race day just under 11 miles and had walked even further. 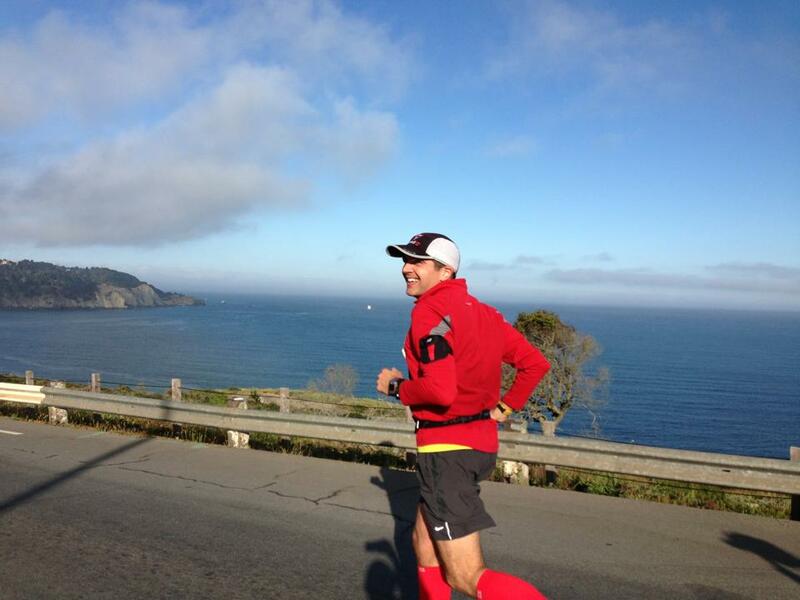 Throw in some massive crazy hills and towers and we were text-book how not to behave before a race. Go us!!! Okay, back to the race. After we toured Alcatraz on Friday (yes hills and stairs not to mention sea legs) we walked along the Embarcadero to the Concourse Exhibition Center for the Expo. Another genius move by me was to look at the map and say it looks walkable, not too far. Umm, try just under 4 miles and we had already run 5 miles and been on our feet all day. 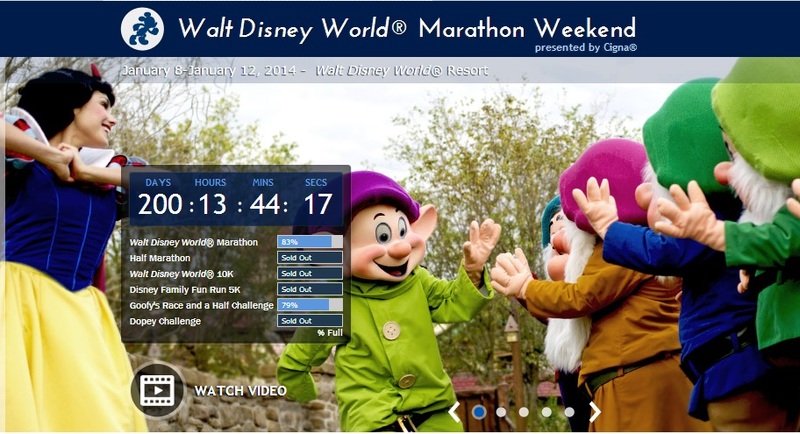 This is beginning to sound like how we do a runDisney weekend…my wife’s motto is “No Sleep Until Philly”. So we walked and walked (again, just a few hilly bits to conquer). The Expo itself was nice, fairly low-key and not too big. I was surprised that being such a big city and a key event that there were not too many national vendors. 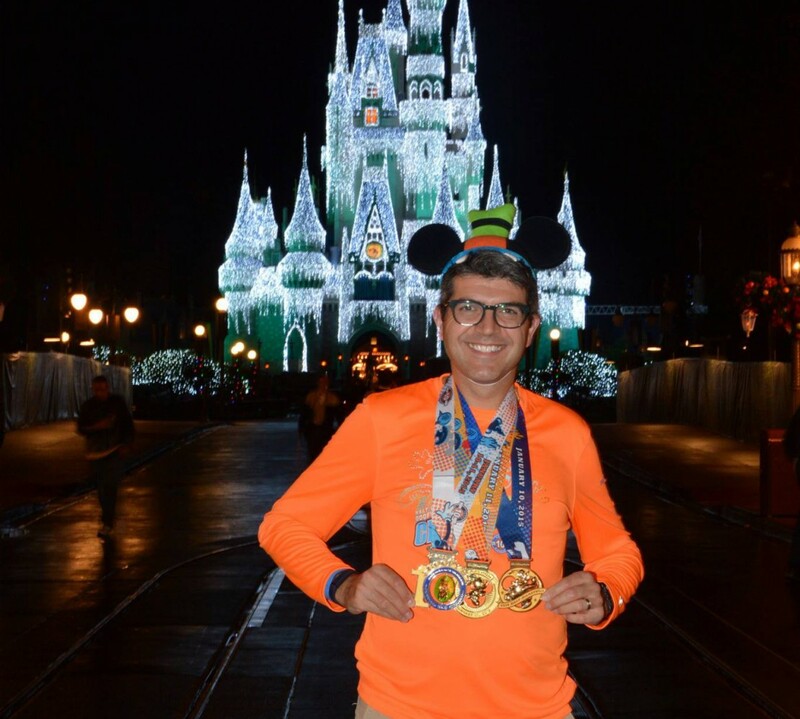 I don’t recall seeing some of my favorite vendors like ‘One More Mile’ or ‘runDisney’ or major manufacturers like Garmin, Brooks and others. Overall, and my wife agreed, this seemed a very low-key event. In fact when we were talking with locals in the shops and restaurants and most of them seemed completely unaware there was a marathon going on over the weekend. The Embarcadero was decked out in flags for next month’s America’s Cup event and there were just a few marathon flags around the start line at the junction of the Embarcadero and Mission Street. Typically you see the signs of setting up, for example tents and port-a-potties but we didn’t see any en route to the Expo. In fact we changed our Saturday run plans to see if we could even see the start line (we didn’t). I’ll touch upon that later when I share the details of the race organization. Having been on our feet most of the day we made up for our energy spent walking by pretty much eating all the samples they were giving out at the Expo. 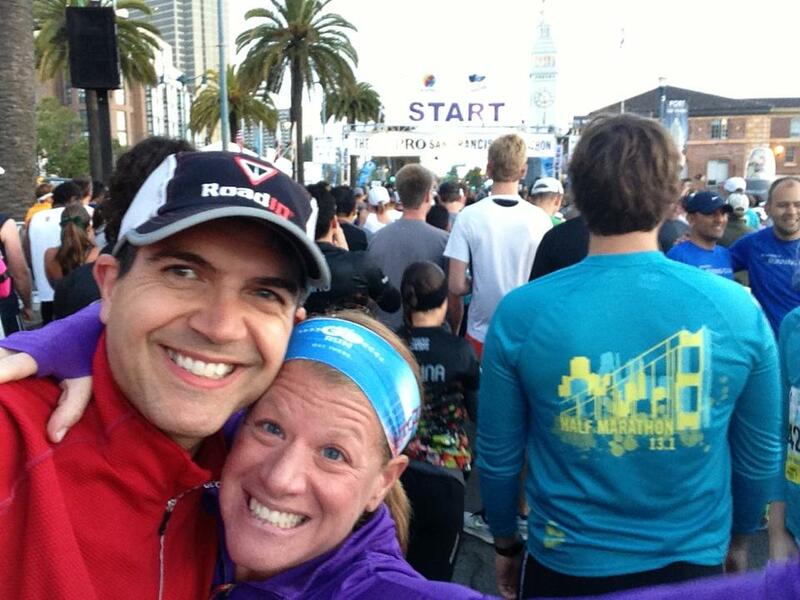 Well, when in Rome…The official race store was nice and both my wife and I grabbed a couple of tops. Lucky for us as San Francisco was colder than we anticipated and we found ourselves wearing our new gear over the next couple of days. 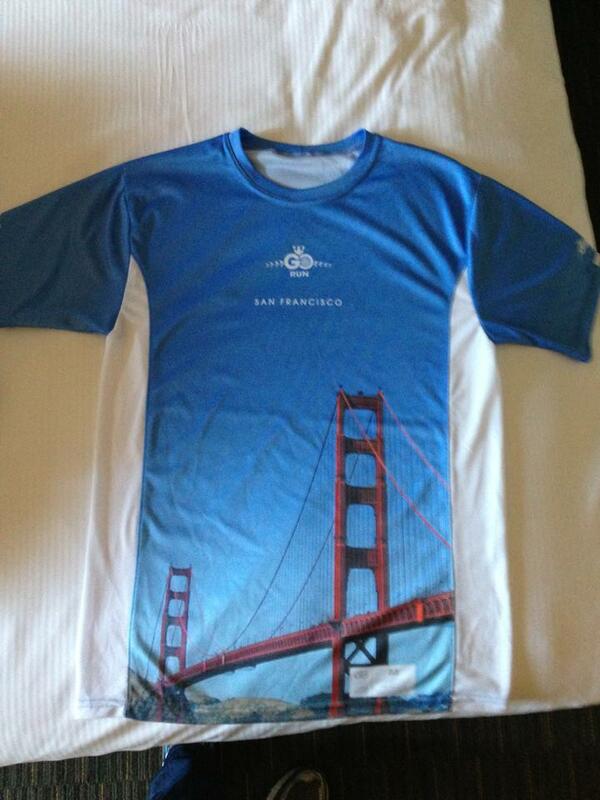 The packet pickup process was pretty easy but the shirts were tiny. Everyone seemed to have to move up a size or two. I ended up with an XL shirt and my wife moved up to an S. People were saying that the shirts were too tight and one lady I spoke with said she couldn’t get here head through the top (it wasn’t that bad and I cannot recall her having a giant head!) Anyway, the shirts were nice long sleeved and looked cool. 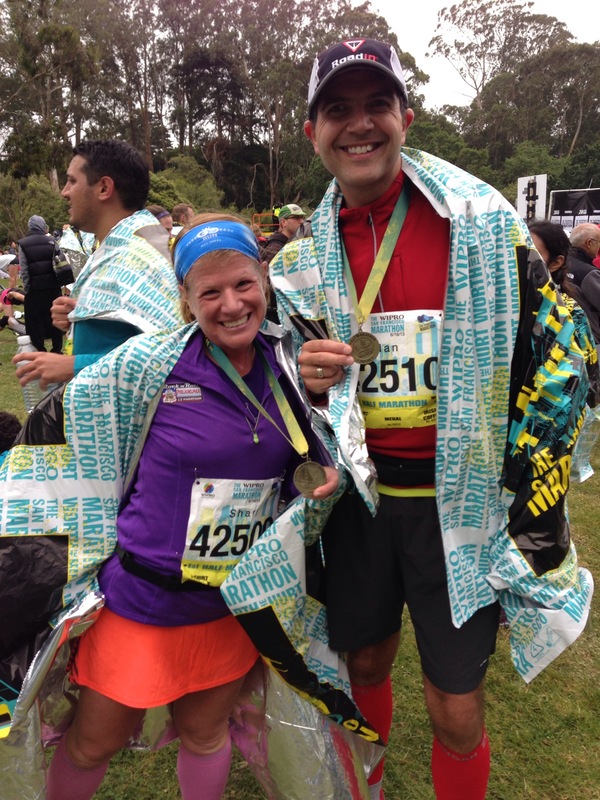 The Half Marathon was teal with yellow detail and the Full Marathon was the reverse. They both looked nice. We both got a race bag which was to be the only bag allowed to bring into the starting area for security reasons and there was a place to write down our bib numbers on the bag. I actually think this was a great idea as I always worry about just attaching a paper tag with a safety-pin to my bag which is identical to everyone elses. Nice touch. Skipping forward to race day (Sunday 16th) we got up around 3:45am as they had asked everyone to get there 30 minutes early for extra security procedures. 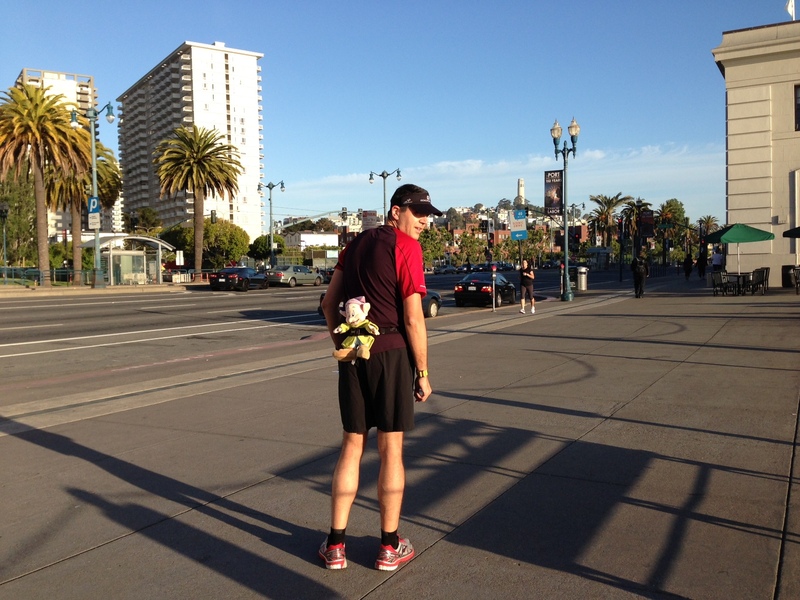 We also had decided to walk to the start line which was about 1 mile from the hotel. We were in good company as we seemed to be on the streets with lots of other runners (the hotel lobby was a popular meeting place I guess) and a few people were actually running to the start line as there warm up. The weather was a nice temperature. I had been worried that it would be cold by the Bay as previous years race recaps had mentioned the wind chill and cool temperatures and I was certain we would be cold up on the bridge. Last year the bridge was all covered in low cloud and certainly looked cold and that was in July, a full month later than this year’s race. Both my wife and I were dressed in t-shirts with a half zip top. I as usual was wearing my thin gloves. Security was pretty smooth, just checking our pretty empty bag. Shari brought her mylar wrap from the 2012 Philly Half Marathon to keep her warm at the start and we lined up for the port-a-potties and headed to the corral with no problems. The Full Marathoners went off in Waves 1-3 and we were in the first Half Marathon wave in Wave 4. We went off smoothly and the first thing I noticed which brought a smile to my face was that we were running alongside palm trees (although planted in the middle of the road) and I just thought, hey, this is California. It’s a nice day for a race. The sky was as crystal clear as you could get. No clouds anywhere which was very much a surprise. As we rounded the Embarcadero, past Fisherman’s Wharf and onto the Marina we got our first glimpse (thanks to the clear sky) of the Golden Gate Bridge off in the distance. It was still about 3-4 miles away but clear to the eye. 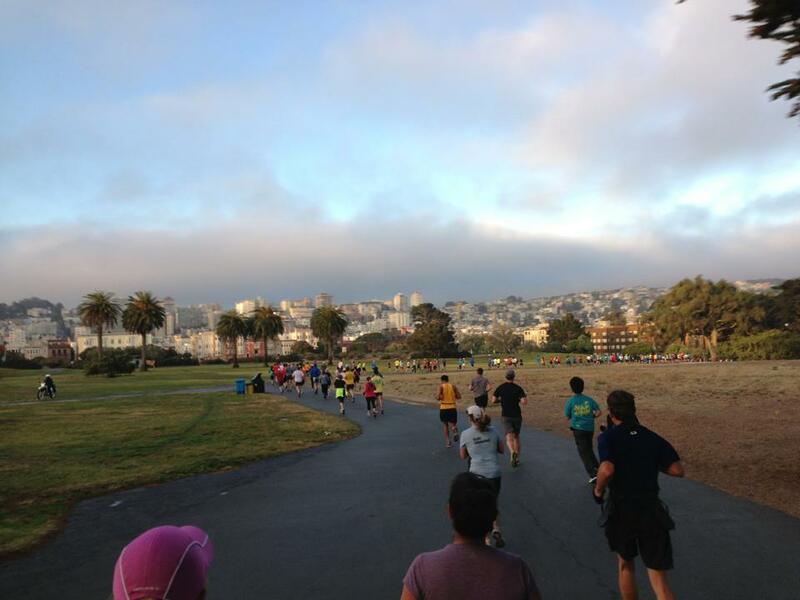 We continued on past the Marina, Fort Mason and Crissy Field and made our way up towards the entrance to the Bridge. One thing my wife and I noticed was the distinct lack of water stations and restrooms along the route. 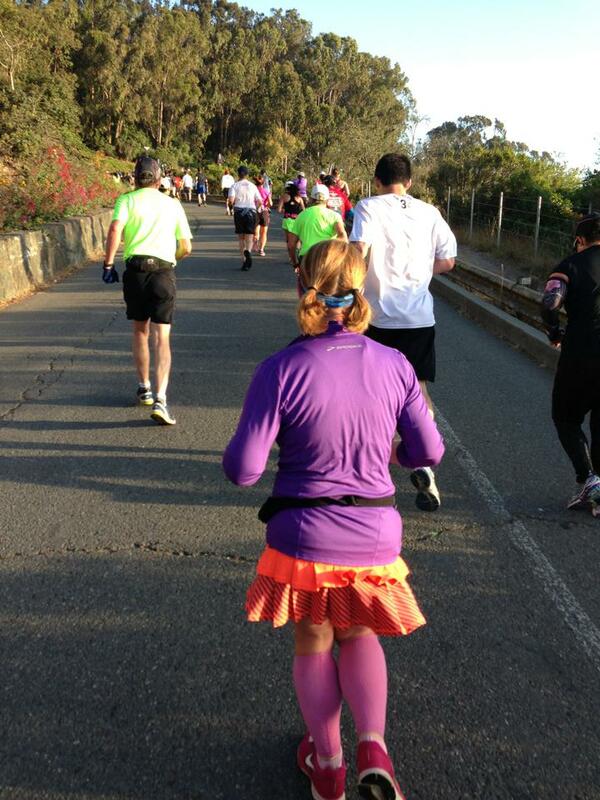 My wife pointed out that a lot of people (more than typical) seemed to be carrying water/hydration belts. They obviously knew better than we did. 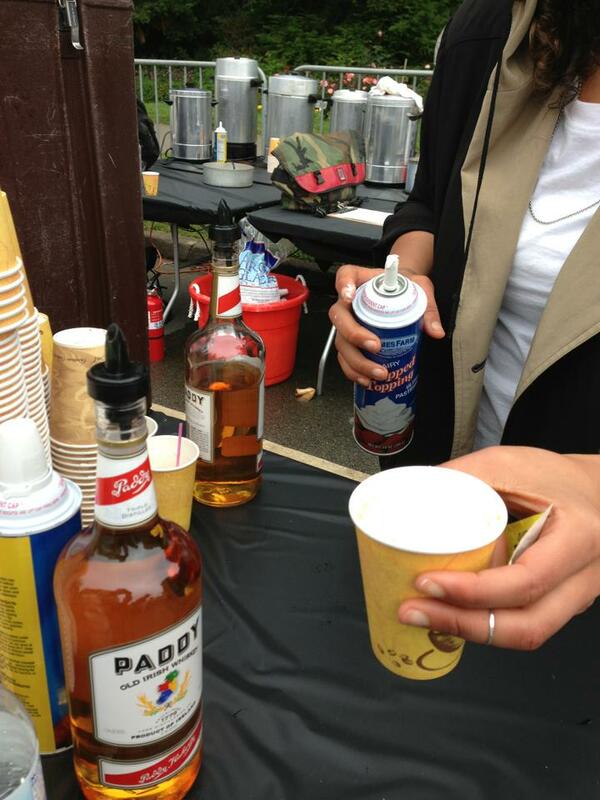 When we did get to the water stations the paper cups were very small, bigger than shot glasses but not much. We found ourselves grabbing two at a time when we saw a water stop. However, this did not stop us from enjoying ourselves. At this point I should mention that this is the first long race where I did not use the Jeff Galloway method. 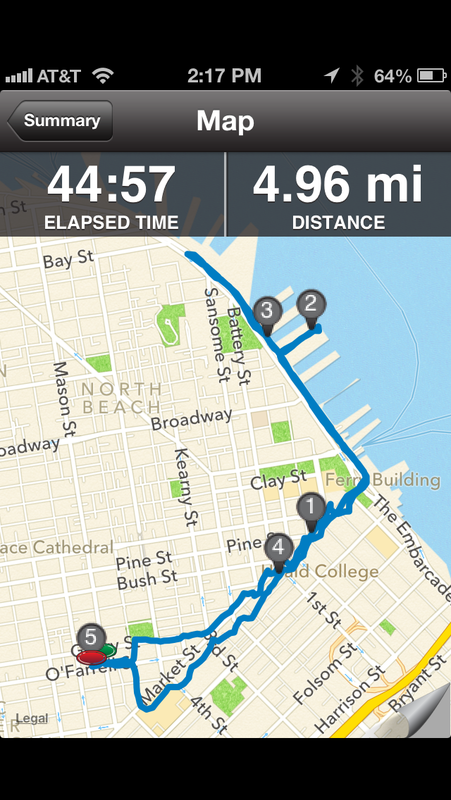 I have been running progressively further without talking walk breaks just to see how I would fare. While we did walk through water stations and stop for pictures I pretty much ran the whole race. I’m sure I will be doing some form of run/walk for the Dopey Challenge next January it was good to see that I was able to keep motoring on without harm. Once we hit the Bridge it was photos galore for my wife and I. It was a mixture of great weather, great views and great company but I was pretty giddy like a school boy up on the Bridge. I was running along holding my iPhone up in the air taking photos as I ran, taking photos of my wife and I and some running selfies. I just had a smile on my face from ear to ear. It was fantastic. 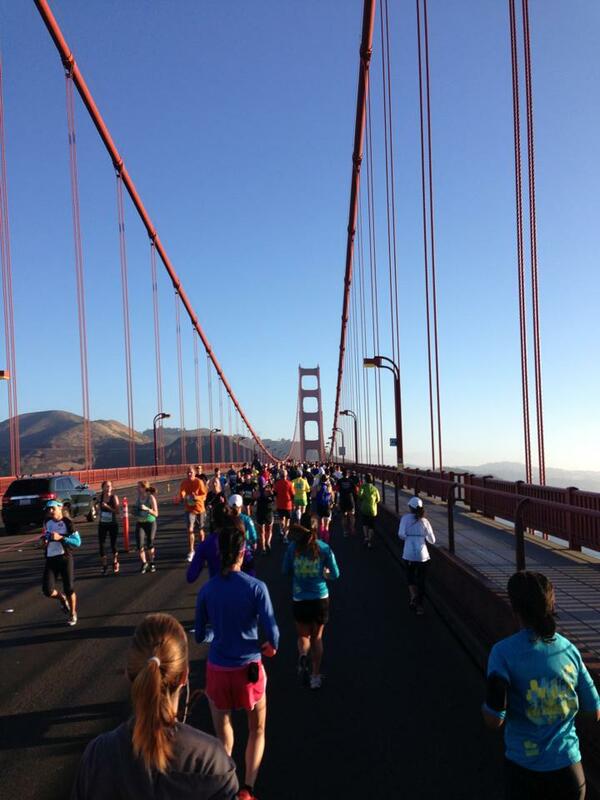 I had grown up with images of the Golden Gate Bridge in my house growing up (my parents had visited San Francisco in 1979 and had framed photos of the skyline around our house) but here I was actually seeing the Bridge AND running it. My wife was also enjoying her self. We took plenty of photos of her jumping in the air (great for the knees mid race). 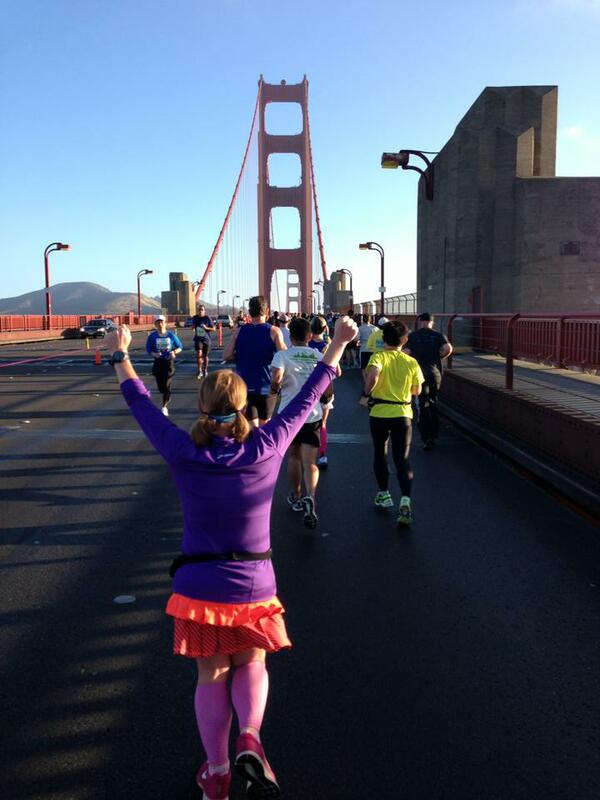 We grabbed a gel, some electrolyte drink and some water and headed back over the Bridge. 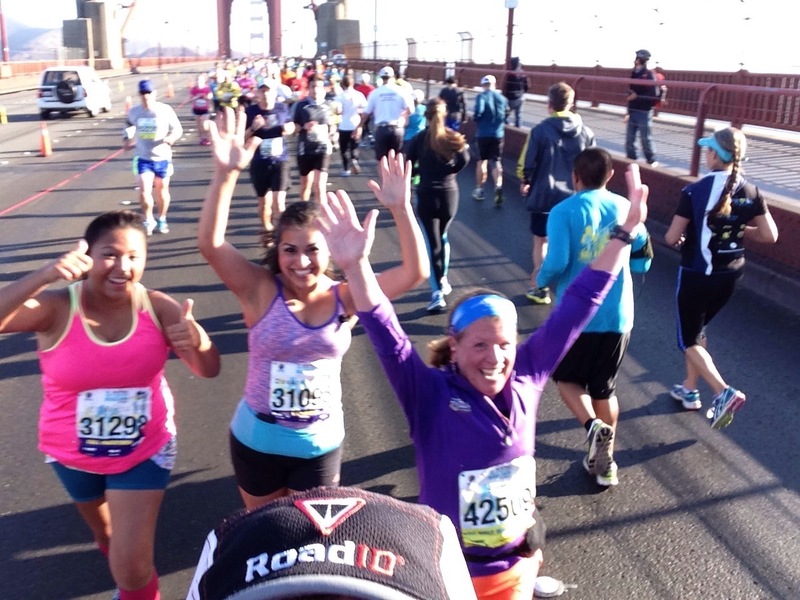 We soon caught up with Mayela and Yasmin and ran the rest of the length of the Bridge with them. This included some very nifty over the head backwards photography by me as I was running (I was getting very accomplished in my running photography). We left Mayela and Yasmin as we reached the end of the Bridge and headed off up the hill (yes, a big one) up to the Presidio. At this point there was a water station at the top and it was warmer than expected due to the clear weather around the Bridge (#overdressed) and we stopped to grab some electrolyte drink and water. I noticed as I approached that they had run out of electrolyte and were ‘mixing’ up a batch of powder and water…that explains why the electrolyte drink tasted funny. It wasn’t premixed and seemed to have been made up of different concentration at each station. That made me grateful the cups were not that big after all. After taking 3 cups or so of water (equivalent to about 1-2 in other races) we started our descent down by the coast line at which point I actually ran out of space on my iPhone and couldn’t take any more photos. At least I got the good views in before I ran out of space. My wife also has an iPhone which we used as back up but most of the views were in the first 10 miles of the race so I didn’t feel too disappointed. 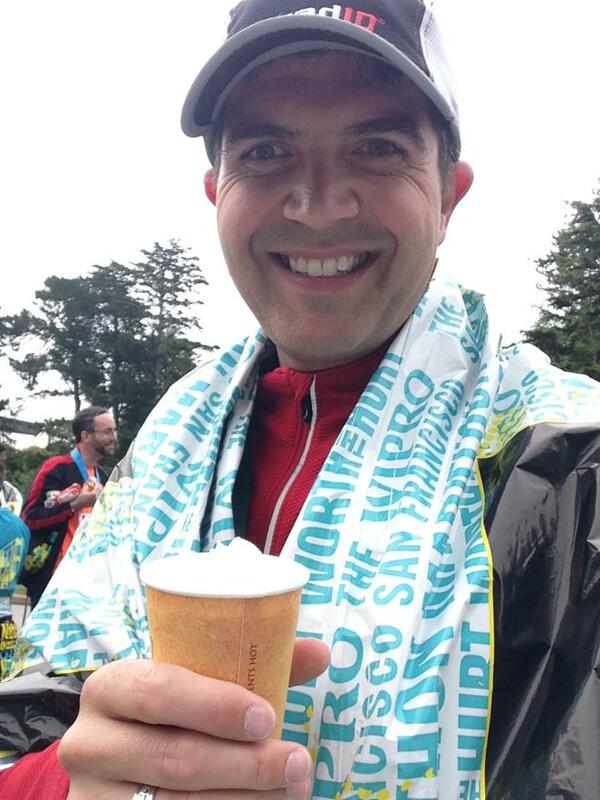 After the Presidio we ran through some residential neighborhoods which were quite hilly but nothing as bad as in the center of the city and they were pretty manageable and we made a turn into Golden Gate Park which was the finish of the First Half Marathon and where the Second Half Marathon started and joined the Full Marathoners. As we finally split off from the Full Marathoners and turned towards the finish my wife and I ran down the finishers chute towards the line hand in hand. This was our anniversary trip after all. As we crossed the finish line we received our medals and headed to the finishers area for our mylar blankets and refreshments. The post race food was different from the usual Philadelphia soft pretzel I’m used to. Irish coffee (yes real Irish coffee with whiskey and whipped cream), scones from Panera Bread, Hawaiian sweet rolls, organic Greek yogurt as well as fruit, natuaral chips and granola. I like West Coast finisher foods!!! We stopped quickly by the Rose Garden in the park for a picture and then headed to the buses which would take us back to the start line and our walk back to the hotel. The walk back (again another mile) was a good way to rest and relax and keep moving. 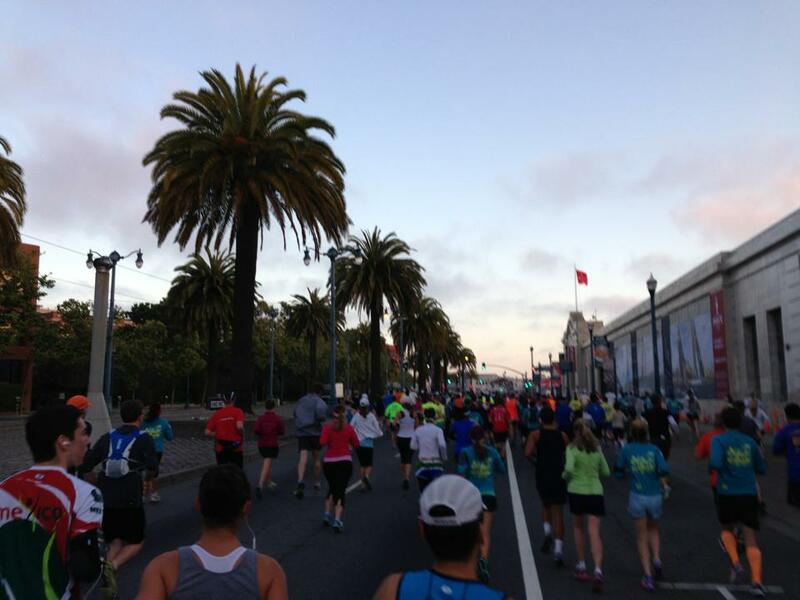 We didn’t really pay much attention to the second Half Marathon out on the course but we did notice that it must have been tough for the Full Marathoners to be running past the first Half finisher area in the park and seeing everyone ingesting alcohol and fancy foods. They would get theirs at the finish (along with chocolate milk, my favorite post race treat, which we didn’t get…and I wanted :-)). After a quick shower we headed back out as we had a full plan for the rest of the day and the next day. 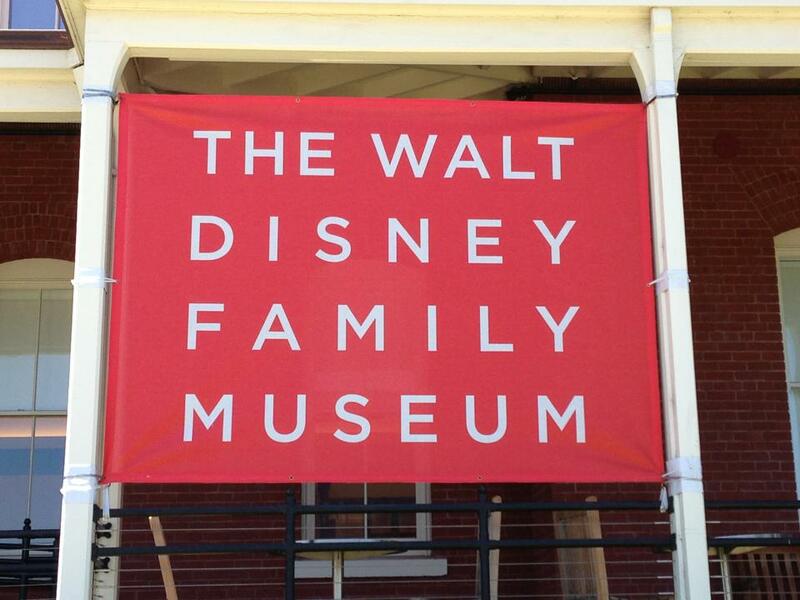 First up, the Walt Disney Family Museum. We are now planning our next destination race. As part of my fundraising for Team Up for next year’s inaugural Dopey Challenge I have set up a virtual 5K. 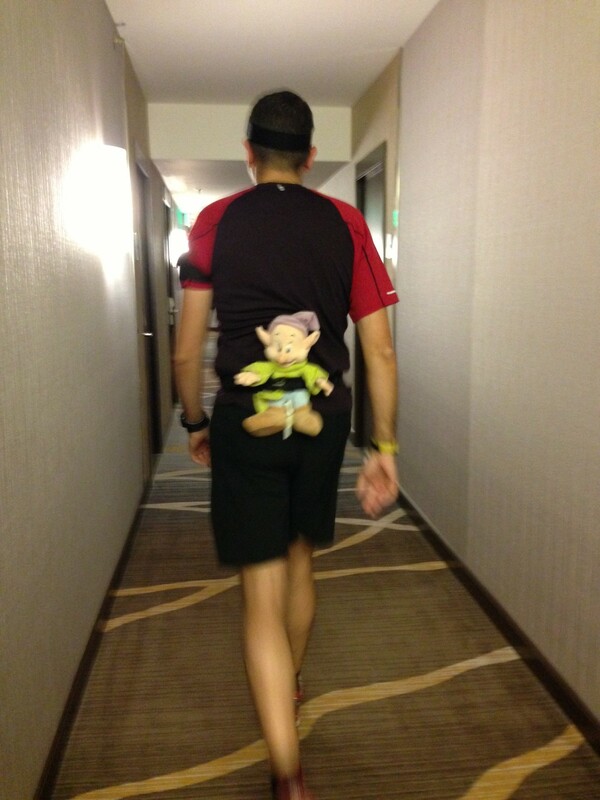 As part of the fun I have been asking participants to take along Dopey on their run/walk. So in addition to earning the cool looking medal the best pictures will be eligible for one of the prizes that were generously donated from some of my favorite vendors. 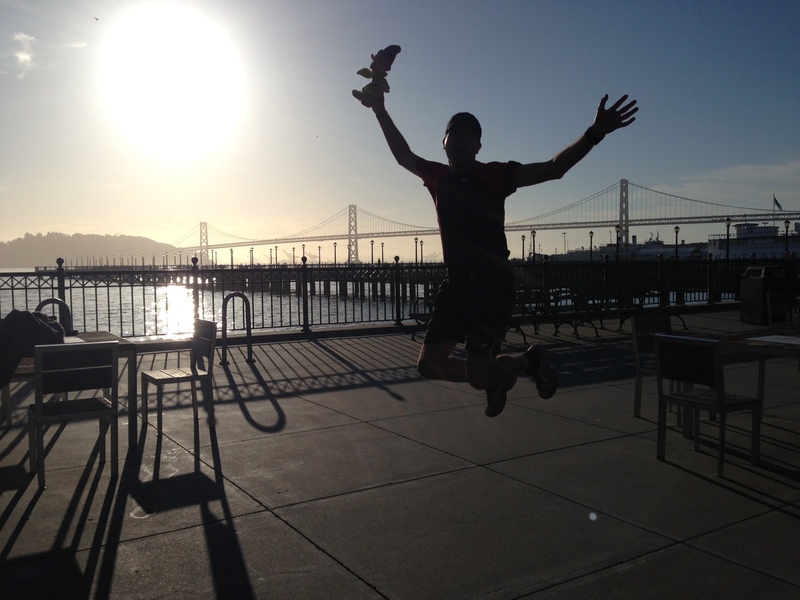 Although I am not eligible for the prizes I wanted to participate in my own event as I wanted to be part of the fun. As this was our first trip to San Francisco we wanted to cover as much ground as possible and really the best way to visit a place is to do so on foot. 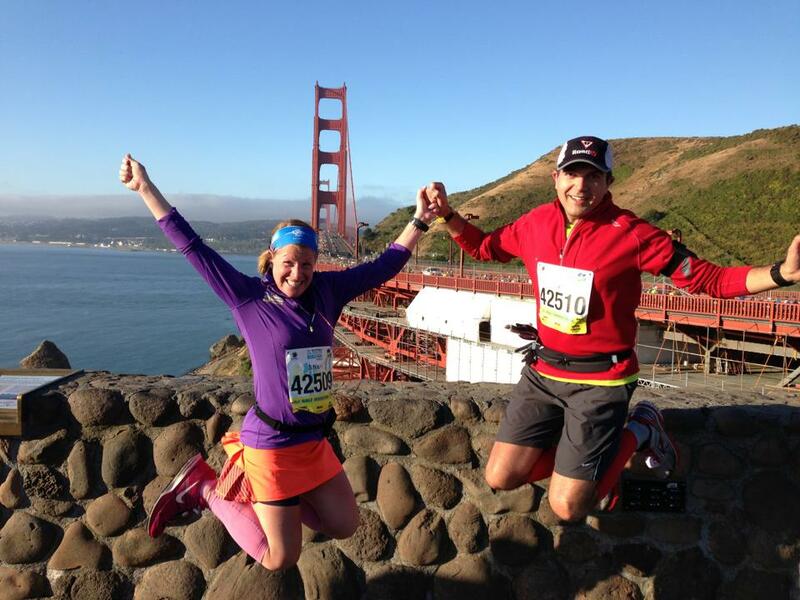 We just happened to do it in running sneakers. 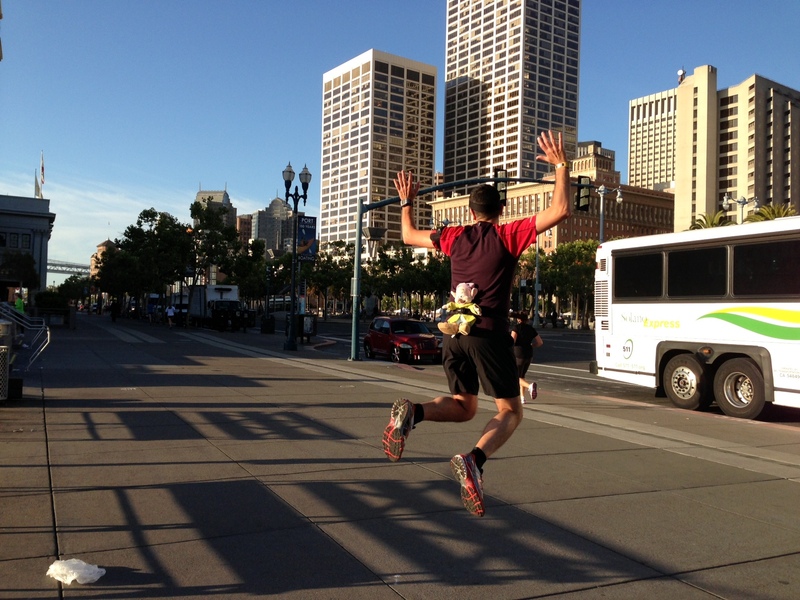 Although we ran pretty much the same route from Union Square along Market Street then along the Embarcadero (it’s not easy to find flat areas to run in San Francisco) we took to this streets for 3 runs in addition to the Half Marathon. We did actually take a day off from running…but we hiked in Muir Woods National Park instead. As you can see from the Garmin maps below we pretty much followed the same route on Friday, Saturday and Tuesday. Just a little different distance and pace on each. 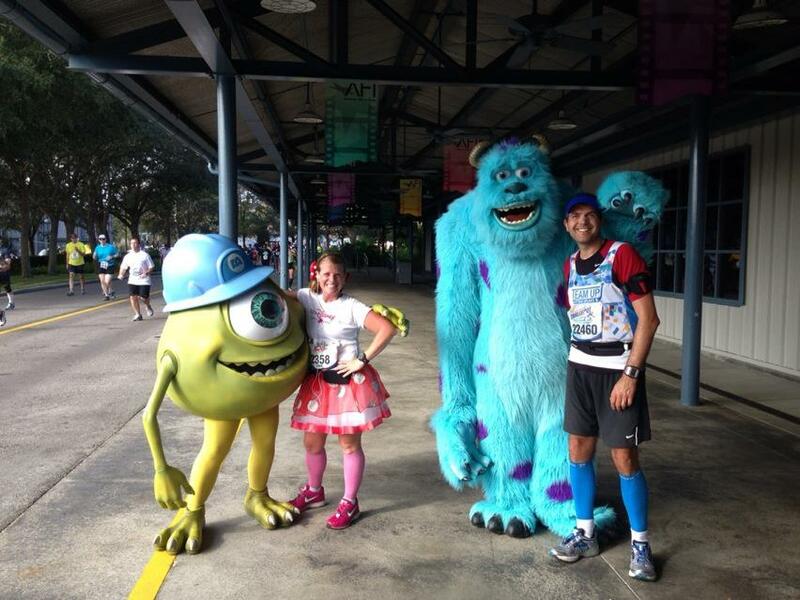 Here are a few highlights of the running the virtual 5K with Dopey (camera credits to my wife 🙂 without whom it would probably have been a single ‘selfie’ with Dopey). There’s still a chance to sign up for the event. It runs through July 31st. Check out the event and the prizes on offer. 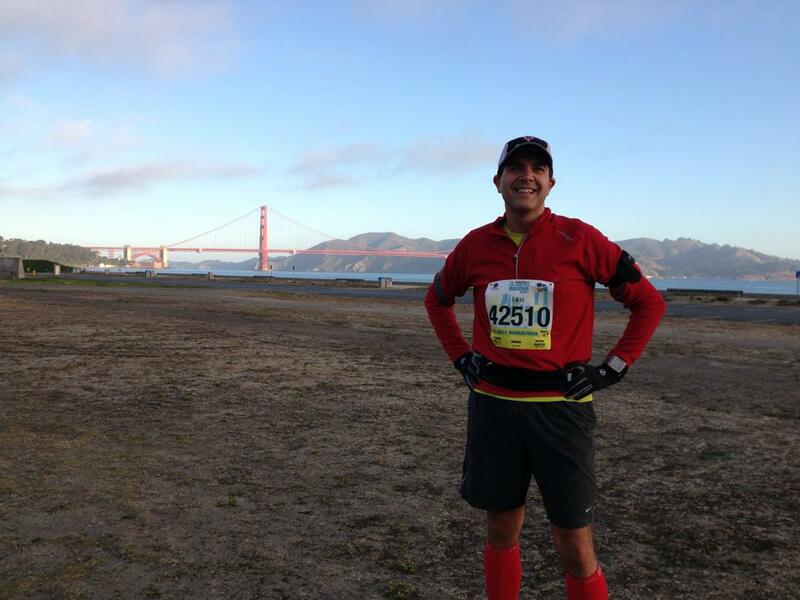 I will be writing a separate post on the Half Marathon.